Women of color have traditionally not had access to the proper tailored tools to empower themselves financially, but this changes with Clever Girl Finance. 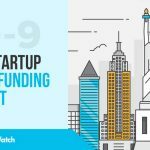 This NYC startup focuses on financial education for minority women and was created by a self-starter, woman of color and daughter of immigrant parents. Bola Sokunbi founded Clever Girl to provide relevant, online financial courses combined with access to a burgeoning community so that women of color are armed with the tools to make impactful and personal financial decisions while avoiding the predatory options that are out there that detract from reaching their financial goals. 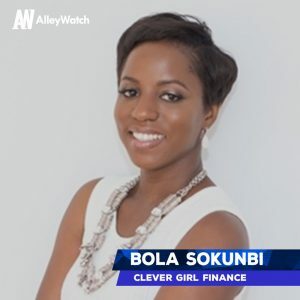 AlleyWatch had the pleasure of speaking with Bola Sokunbi to discuss the inspiration for the company, its future plans, and its experience with the latest class of Techstars NYC. Tell us about the product or service that Clever Girl Finance offers. Clever Girl Finance is a financial education platform that focuses on educating women of color, through bite-sized, easy to digest courses and access to an engaged community. Our vision at Clever Girl Finance, is to empower the current generation of women of color, with the education they need, to make sound financial decisions and become financially successful. How is Clever Girl Finance different? The median net worth of a woman of color is ~$150. Despite the fact they make more money than their parents’ generation, they are acquiring more debt than assets, a lot of which is tied to socio-economic backgrounds and predatory targeting by financial institutions. We are empowering women of color with the life-changing education they need to succeed with their money. We offer foundational financial courses as well as courses tied to our members’ life events such as paying off student debt, getting married, having a baby, or even starting a business – and we keep our members motivated throughout their entire journey. What inspired the start of Clever Girl Finance? 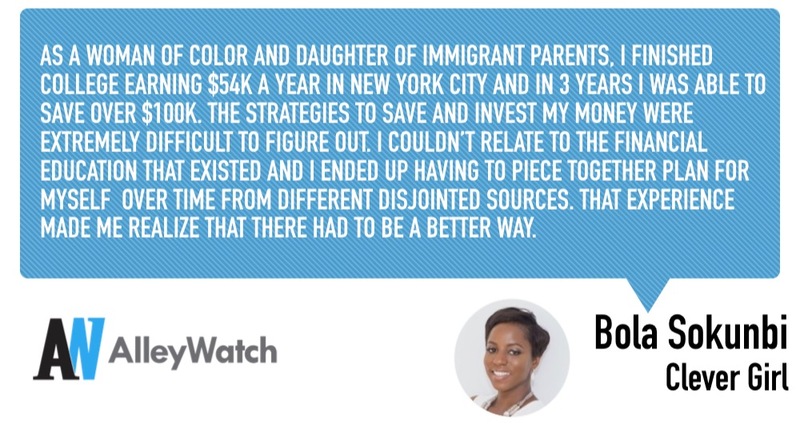 As a woman of color and daughter of immigrant parents, I finished college earning $54K a year in New York City and in 3 years I was able to save over $100K. The strategies to save and invest my money were extremely difficult to figure out. I couldn’t relate to the financial education that existed and I ended up having to piece together plan for myself over time from different disjointed sources. That experience made me realize that there had to be a better way. What market does Clever Girl Finance target and how big is it? There are 20M employed women of color in the United States that fit our target audience. We provide a monthly subscription at $10 a month or $99 a year, that includes an extensive library of financial courses with brand new courses added every month. Subscribers also get access to a community of like-minded women keeping each other accountable, and access to vetted financial products which are tied to the best interests of our members. Tell us about your experience with the Techstars program. What kind of progress has the company made during the program? My Techstars experience has been incredible. I’ve learned so much and definitely grown all around as a founder as a result of the support and guidance of the Techstars community and my mentors who have supported me through the journey. Our milestones are all about growth – especially acquiring new customers and expanding our content library from the current 21 to 50+ courses. I’m based in New Jersey and the largest aggregation of my audience in one place also happens to be in New York. Plus the thriving startup community here makes it the perfect place to launch.